The day a precious child comes into your life is the day your life is changed forever. I thought that I carried a lot of stuff around with me BEFORE Riley was born, but since Riley? My head spins at all of the necessities I must take anytime we leave the house. Of course, we need to have plenty for her to eat and drink, a pacifier, diapers and wipes, a few toys to keep her entertained, hand sanitizer and an extra change of clothes. Whew! In order for a mom to be properly prepared, a good baby bag is key. Amy Michelle has been making well-designed and fashionable baby bags for years and I was so excited to have the chance to review the Azalea. Keep reading to find out whether or not the Azalea was up to the task of traveling with Riley! 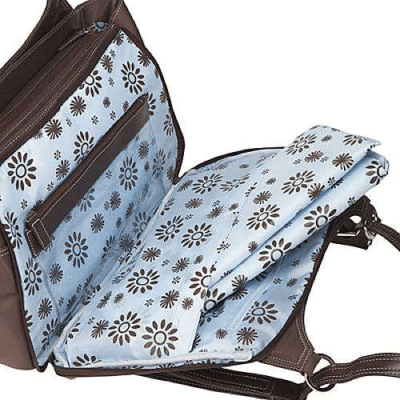 I reviewed the Azalea Baby Bag in Chocolate with Periwinkle Lining from Amy Michelle, which retails for $135.00, but is currently on sale for $89.99. UP TO 5% OF THE PROFIT OF EACH SALE GOES TO THE RONALD MCDONALD HOUSE CHARITIES OF DENVER. The reason that I love Amy Michelle diaper bags is that they don't look like diaper bags at all! I actually already have a purse similar to the way the Azalea looks on the outside, so it makes me very happy to know that I no longer have to sport a large pastel green baby bag with a large yellow duck emblazoned on the front! What I also love about Amy Michelle bags is that they are designed with both mom and baby in mind. There are several features of this bag which are dedicated just for mommy, with the overall design and appearance being a major one! 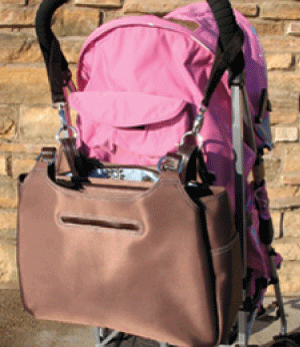 One of the most versatile features of the Amy Michelle Azalea Baby Bag is the stroller attachments included. These two straps open up to attach to the handles of any stroller so that you no longer have to try and stuff your baby bag in the bottom mesh compartment of your stroller, or even worse, carry it the entire length of your trip. I had never seen this feature on another baby bag before the Amy Michelle bags and I thought this was a super functional idea! Every mom knows that if you are out and about with your baby or toddler, you need both hands free at all times and even an extra set of eyes in the back of your head, if possible! :) Now, with the Azalea baby bag, you can automatically convert it to a backpack and strap it on for greater comfort to your back and shoulder as well as freeing up both hands too. Perhaps my absolute favorite feature of the Azalea would be how well designed it is inside. There are three compartments in this bag, including a sleek outer pocket, which is perfect for storing your keys and cell phone. This way, you can always reach them quickly and easily, without digging around inside wondering where you put them. The Azalea is also great for use as a baby bag and even later on as your child grows older, as a purse or travel bag for you. For instance, the Azalea has a nifty zippered compartment, which houses a washable changing pad and see-through zippered pouch, great for storing baby wipes, diaper cream, hand sanitizer, etc. After baby grows up, I plan on removing the changing pad and using that pocket as a place to hold my Kindle or iPad while on the go. The zippered see-through pouch would then make a terrific makeup bag for quick touch-ups while traveling. 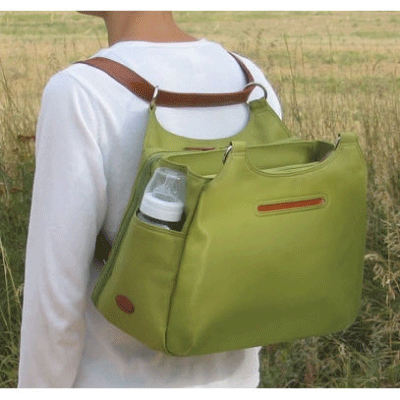 The large inner compartment is great for storing diapers, toys, baby bottles or sippy cups, etc. There is even a quick release pacifier holder located here for those paci-emergencies! Of course, later on I plan on using the baby bottle holder to carry my water bottle, the pacifier holder to secure my sunglasses, and all of the extra pockets to keep me more organized! I could use some of these smaller pockets to carry my store coupons, sewing kit, etc. 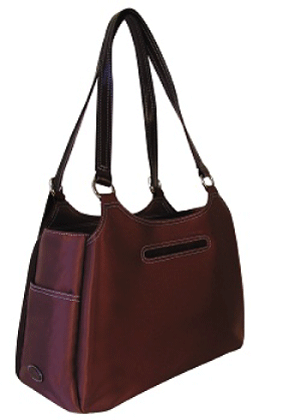 The third and final compartment of the Azalea is just for mom and designed to hold your wallet, checkbook and keys. This is great for now I no longer have to carry my purse along with Riley's baby bag, or try and find my belongings which are always mixed up with hers if I just use her baby bag to carry both our things. If there's one thing I am certain of after reviewing the Amy Michelle Azalea Baby Bag, it's that they spent a lot of time and effort designing a bag every woman would love. I just know that I will have this bag at my side for many years to come, even long after Riley has outgrown a baby bag. I would highly recommend the Azalea baby bag for a baby shower gift, birthday gift or Christmas gift for I just know the recipient will love it as much as I do! Disclosure: I received the Azalea Baby Bag in Chocolate with Periwinkle Lining from Amy Michelle in order to facilitate my review. No other compensation was received. This product review is based on my own personal experiences with this item and is completely honest and objective. thanks for your comment,can’t see you among my followers …?! Hmmm…don’t know why not. I followed you back.